Screen Issue: No backlight (flashlight reveals content). Fuse? WLed? - It stopped working after the third party HDMI cable broke when the TV did something strange. I guess some kind of discharge. Don't know if it's coincidence though. - Since that "incident" it stopped working gradually, sometimes integrated screen would come on, sometimes not. Once it came alive while tapping gently the black strip at the back of the macbook, but when I closed it and opened it back again, never came on again. - Right now the internal screen haven't been on for a while (I'm using external). - I'm expecting to understand where's the problem. Identify the FUSE and how to check it, identify the WLED and how to check it. Maybe check the LVDS cable if I'm lucky that's the problem. Have no experience in chipset repair so at least I would like to identify the problem so as not to get ripped off by the technician here in Argentina. @oldturkey03 the number is 820-3330-B . Is this any help? And please would be nice to know how do I "check" it... I mean, what to do to realise if it's dead or working... Thanx! I did the continuty test with the multimeter set to Ohm's and it beeped and gave me an oscilating result between 00.2 and 00.4 (originaly is at 1 and quickly goes down). So, continuity seems OK for the OHM test. This leaves me in an even more intriguing scenario. Maybe the flex cable? Anything else I can test with the multimeter? I have my friend right here with me who is lending it to me for the tests. I unscrewed my monitor completely from the macbook pro and played a little moving the LVDS cable. I left all disconnected but I plugged the LVDS cable and power on the computer...I got light! The screen working perfectly. Then power it off and re-assembly everything to place and again no backlight... but this shows that the backlight itself it's ok. So I guess the problem would be in the LVDS cable? My theory is that when I set it loose it made the connection temporarily? What do you think? Take a look at your LCD cable itself and look for any burn marks or damage. I once chased a backlight issue from IC to IC for 2 hours before I checked the cable and found pins 1 and 3 where fried. I took everything apart, I mean dismounted the monitor from the computer, unplugged all cables, jiggle a little bit with them, checked the connection of the display cable to the screen, for that I had to take off the black protector on the bottom of the screen where the antennas and display cable is, and I mounted all the computer again without it and now it's working perfectly. I can only assume this is a cable thing that when pressed stops working. Maybe it's pinched somewhere. Or maybe a bad connection inside the LCD that when I push everything it worked. If there was any chipset problem I shouldn't be able to be working on my computer right now as I am. I already restarted the computer several times, closed and opened lid and my LCD is perfect. I hope this lasts, maybe I'll change the display cable (take it to an expert because it's no game) just in case. I ordered one vía amazon.com. Thanx to all for the help. @mauma check the fuse for continuity. Use multimeter and check it the same way as shown here with a bigger fuse. You can also check it to see if you have power going to the circuitry. For that connect the negative probe of your multimeter to ground and touch the end of the fuse with the positive while your machine is powered up. You should have 12 V on that. When you do that, make sure that you do not touch any other contacts etc. Don't want to shorten out your board. You should still post a picture with the LVDS cable disconnected and a close up of the connector. It will help to rule it out. FYI the fuse is a 3 amp 32 V fuse in a 0603 package. @oldturkey03 this is great! I finally saw the P fuse! My friend is lending me a multimeter today and I'll test it. Just to be sure, when you say "ground", that would be anywhere outside the mac like my desk iron legs or similar? Or the mac has a ground connector somewhere? http://imgur.com/a/rU8OL here are the photos of the LVDS connector. It seems fine to me but maybe you can see something I am missing. Thanx for all your help. @oldturkey03 I did the continuty test with the multimeter set to Ohm's and it beeped and gave me an oscilating result between 00.2 and 00.4 (originaly is at 1 and quickly goes down). I am being carefull on the second test you ask me because I don't want to burn anything ahahaha. Could you be more specific exactly on where to position the positive and negative probes of the multimeter and how should it be setup so as not to burn any other stuff in it? @oldturkey03 i did the voltage test on the fuse! i got 11V in each side of the fuse… so this means that the power is coming through? That would mean the problem maybe is on the flex lvds cable? or could it still be the WLED driver? @oldturkey03 I updated with this: I unscrewed my monitor completely from the macbook pro and played a little moving the LVDS cable. I left all disconnected but I plugged the LVDS cable and power on the computer...I got light! The screen working perfectly. Then power it off and re-assembly everything to place and again no backlight... but this shows that the backlight itself it's ok. So I guess the problem would be in the LVDS cable? My theory is that when I set it loose it made the connection temporarily? What do you think? Check your connector and cable carefully. @mauma check for a short to ground on pin 1 of C9799 and also check the voltage on pin 1 of this and let me know. Would recommend getting board view and schematic for the 820-3330, so you can use the board view software to find the component. @jbwftw check voltage on pin 2 D9701 to see if U9701 is working properly, and let us know the voltage. U9701 is only for the backlight. @reecee Thanks, I will try that. 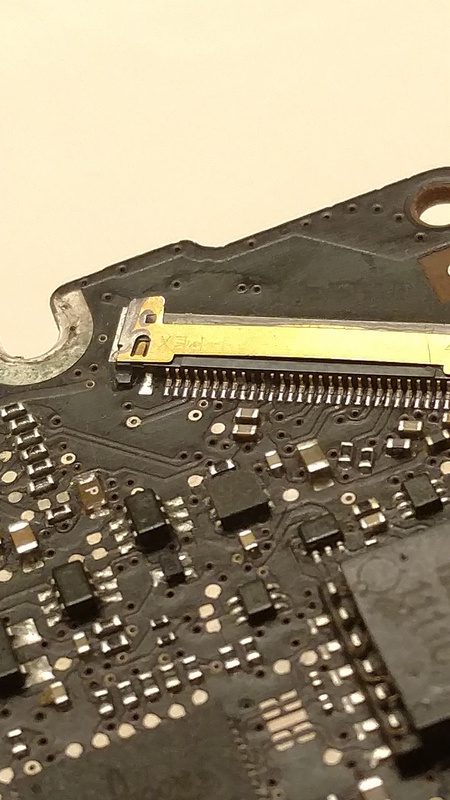 Also in the above answer I posted this image, could my LVDS connector be the culprit? @jbwftw pin 21 and 22 has something in the middle, can't tell from the picture if this is melted plastic or where the pins bridge together, since these are both for PPVOUT_SW_LCDBKLT. Pin 18 looks a bit bad (could be lighting), but this is for the display clock circuit, so if you resolve the backlight and it just shows a black screen, then you need to sort this out. If it is melted plastic replace it (obv measure for backlight first). If the cable was burnt, replace it anyway because it messes up the inside of the connector. Before doing anything though, measure the points to see if U9701 is boosting the backlight voltage or not. @reecee Scrubbed the pins clean and it appears they are all there and just fine. Tried testing U9701 but turns out my multimeter is broken, so will update after getting my new one. Look for a small, white IC (ant size) with a "P" in the middle of it. You may need a magnfying lens to see the "P". It should be near the LCD connector. Check it with a multi-meter. Set it to Ohm mode, and put one side of the probe on each side. If the "fuse" (technically called a filter) is good, it should read all 0's. Make sure the battery is disconnected and power is unplugged before doing anything. @rneeley thanx for this ! I'll be back when I run the test! Just set your meter to OHM mode and put one probe on one end of the fuse, and the other probe on the other end. This tests if their is resistance in the fuse. If you get a reading of anything but all zeros, the fuse is blown. Technically, you can bridge the fuse to bypass it, but unless you really know board level repair I would not advise it. If whatever caused the fuse to blow in the first place is still present, it would cause more damage. @rneeley The read was 00.2 and 00.4 ... the same reading as if I touch the probes to each other... do you think this is blown? I thought it was OK! Alex zal eeuwig dankbaar zijn.